KYRIE IRVING GOT his wish and the Celtics got the star fans have been craving for years as Boston and the Cleveland Cavaliers finalised a blockbuster trade. The Cavaliers and Celtics finalised a trade on Tuesday that sends Irving to Boston in exchange for Isaiah Thomas, Jae Crowder, center Ante Zizic and the Brooklyn Nets’ 2018 first-round pick. Irving had asked for a trade out of Cleveland earlier this year, and the Cavs obliged. “Kyrie is one of the best scorers in the NBA. He has proven that on the biggest stage, the NBA Finals, the last three years,” Celtics president of basketball operations Danny Ainge said. The rumour mill surrounding a potential Irving trade had quietened in recent weeks, but it always seemed likely he would be playing for a different team during the upcoming season. While the Cavaliers received a good haul in return for Irving’s services, it was still shocking to see Cleveland agree to send him to an Eastern Conference rival. Irving now has the chance to be the face of a storied franchise and will immediately have an opportunity to lead his new team to the NBA Finals. Despite competing in three straight NBA Finals – winning one – the Cavs seemed to endure some discord this offseason with Dan Gilbert failing to renew former general manager David Griffin’s contract. LeBron James exit rumours started to swirl shortly after, followed by Irving’s desire to move to a different team. Turmoil aside, the Cavs will likely start James, Thomas, Crowder, Kevin Love and Tristan Thompson next season. They could also add Dwyane Wade and will be among the favourites to challenge the Golden State Warriors for the title. Email “Massive NBA trade as Boston pick up superstar Kyrie Irving and send Isaiah Thomas to Cleveland ”. 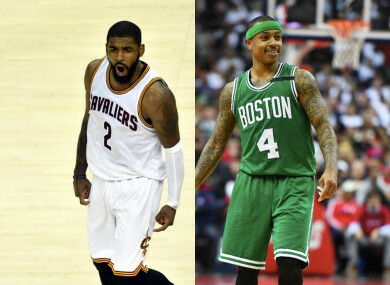 Feedback on “Massive NBA trade as Boston pick up superstar Kyrie Irving and send Isaiah Thomas to Cleveland ”.